If you wish to see Central Asia, you need to be prepared to rough it out to some extent since tourism is still in a state of development here. There is rich unexplored geographical terrain to discover and rich cultures and history that we have read about but never seen with our eyes. Central Asia is a region that is dominated by countries that have been ravaged by dictators. There are deserts and nomads all around. The cities along the Silk Road are what you will witness as well as staggering mountain views and some of the ruins of war and the spoils of a Soviet reign that is now being undone. Countries like Turkmenistan, Kazakhstan, Tajikistan, Uzbekistan are the countries that you will come across if you are to make a trip to Central Asia. Many people wonder what is there to see and whether it is worth taking the risk to travel to such counter. Indeed, travel and tourism are being promoted there and it is relatively easy to travel and safer than it has ever been. Thus, to plan a trip to an exotic location that is not talked about much, you must pay a visit to Central Asia. Your first stop could be Turkmenistan. It is not easy to get into Turkmenistan due to the red tape and visa complications that exist. However, if you are able to get inside you will find a lot of memorable things to do and see here. The Caspian Sea is a must see in Central Asia. You can take an overnight ferry across the Caspian Sea from Baku in Azerbaijan to Turkenbashi in Turkmenistan. It is a beautiful experience crossing the Caspian Sea. Ashgabat is the capital city of Turkmenistan which will remind you of Las Vegas due to the health walks and the fountains and the white marble facades. 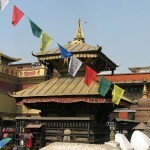 It is known for its largest open air markets which start early. There are even soap operas and disco scenes to be witnessed in such marketplaces. Gonur deep which is an unexcavated site will lead you back four thousand years in history. The cities like Merv and the Konye-Urgench provide a taste of cities and life on the Silk Road. 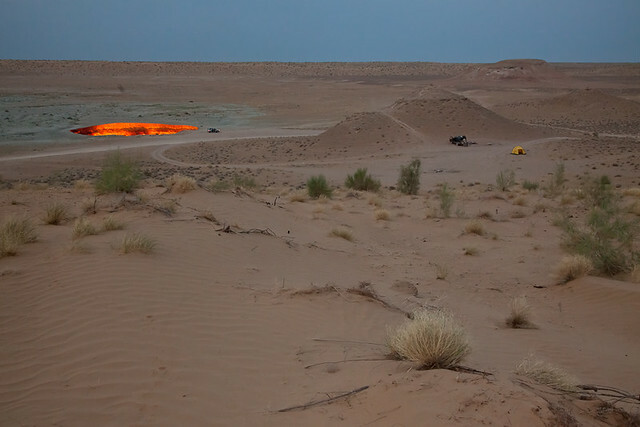 Karakum desert is a must visit as well as the Darvaza gas crater which is created here. When you stand looking down into this giant crater you will be sure to appreciate such a sighting and if you spend a night here in a tent you will love to see it on a full moon night. It gives a peek into the desert life here. Uzbekistan is the next step that you can plan. There are cities here along the Silk Road that are worth visiting for their historical significance. Samarkhand, Tashkent, Khiva, Bukhara is the cities here that you need to visit to get a feel of the culture and history of the place. Nukus and Moynaq are other places to visit here which bear testament of the war that human civilization could wage on nature. Rusted boats lie on a shoreline that is now a desert. The Aral Sea and its degraded form is a sad sign but a learning for sure for other civilizations. Next in line should be Kazakhstan. It is a dangerous quest when you are crossing the land border from Uzbekistan. If you do survive then you will get to see the Tian Shan mountains as well as the Big Almaty lake which has surreal blue water to feast your eye upon. Kyrgyzstan is another country in Central Asia worth visiting. It is mostly mountainous and has beautiful landscapes to gaze at. The people here are mostly of nomadic culture and they are warm and inviting. You can stay with the local people and in yurts and take treks in the mountains on horseback.